I have to admit a certain degree of scepticism when it comes to watching new films made by ageing auteurs. Though it is of course pleasing to see the septuagenarian, or older, likes of Godard, Rohmer and Chabrol continuing to be able to find both the finances and audiences for their work, one cannot help questioning how vital or fresh their output can have remained, some half century after first coming to prominence. Andrzej Wajda might appear at first to be another such case. First coming to prominence as part of the Polish Film School in the middle 1950s, he has spent the last fifty years largely documenting his country’s tragic history, not just its plight during the twentieth century but also in centuries past. Though not entirely confined to political filmmaking, this part of his oeuvre is what he is most clearly identified with, in particular his 1950s ‘War Trilogy’ of A Generation (1954), Kanal (1956) and Ashes and Diamonds (1958). What makes his career output persistently interesting is that considering his films allows us not only to trace his development as an artist, but also to examine how they reflect the political climate in which they were made. Man Of Iron (1981), for example, was an historical drama with clear parallels to the burgeoning Solidarity movement, made at a time when censorship had been relaxed to such an extent that a clearly propagandist work could pass through the authorities’ gazes unchallenged. This, in a sense, is what has made his work of continuing relevance and freshness despite his advancing years. His latest, Katyń, is no exception, focusing on the now infamous massacre of an estimated 22,000 Poles by the Russian Secret Police in 1940, and based on the bestselling book Post mortem by Andrzej Mularczyk. Poland’s unique misfortune in World War Two is introduced to us in an opening scene: it is 1939, and refugees are fleeing the eastbound invading Nazi troops, crossing a bridge only to encounter men running towards them from the other side. The Russians have invaded from the opposite frontier, and the country is now squeezed between the far Right from the west and the far Left from the east. The Molotov–Ribbentrop Pact of non-aggression signed between the two invading powers appears to have consigned Poland to a dire fate. Initially we view these events through the eyes of Polish Army captain Andrzej, whose wife and daughter Nika have crossed the country to find him and bring him back to safety. The Russians, whilst allowing rank and file soldiers to return home, have incarcerated members of the officer class as well as leading intellectuals as part of their purge of possible insurgents, and Andrzey, unwilling to renounce his vows of allegiance to the Army, is taken into Soviet captivity. The film then splits into two main narrative strands. Now being held huddled inside a repurposed church and including Andrzej and fellow officer Jerzy, the captives contemplate their collective fate; some anticipate help from the Allies – surely they cannot do without tens of thousands of trained soldiers – while others are far more pessimistic. What fate too for their country? Divided up between the Germans and the Russians, or the bloody battleground when those two ideologically opposed bedfellows almost inevitably turn against each other and come to blows? The second strand, and more of the film’s focus, settles on the lives of the families of those being held captive. Anna nervously waits for news of her husband’s return. It transpires that in Soviet-occupied areas, wives of officers are swiftly being rounded up too, and she learns that she must escape across the demarcations line to the Nazi-controlled western half of the country in order to survive. Andrzej’s father, a prominent academic, has been captured too, and likely to meet a similar fate to that of his son. Time passes, but Anna refuses to lose hope. News of the Katyn massacre eventually reaches them, gleefully reported through public loudspeakers by their German occupiers, along with newsreel footage showing the mass graves and the method of execution used, apparently typical of the Bolshevik regime. The war ends, and one might expect the story to end too, yet as with Clint Eastwood’s Flags of Our Fathers (2006), the disappearance of armed conflict from the story merely marks the end of the film’s first act, and the propaganda war has only just begun. The new Communist government of Poland wipes its hands of the massacre, claiming that it took place in 1941, and so at that point in time it had to have been perpetrated by the Nazis. We are shown through several narrative threads how this lie was perpetuated through a multitude of official channels: a woman is not allowed to have the correct date of her brother’s death placed on his gravestone; a university applicant whos father died at Katyn must ‘correct’ his resume in order to be accepted, and Jerzy himself, who survived the POW camp and is now an officer in the new national army, must censor himself in order to keep his job. The very same newsreel footage shown earlier as illustrating the hallmarks of Russian executions has now become illustrative of the SS. Wajda saves the film’s most harrowing scenes for the coda, a reconstruction of the actual killing processes themselves. Despite all of the portrayals of the horrors of World War Two seen in films previous, there is something uniquely chilling about these final moments. The methodical nature of the killers rendered here with a savage eye for seemingly trivial detail, detail which only heightens the feeling of appalling horror: a dark basement with its blood-soaked floor carelessly rinsed after each victim, and the metal ramp used to slide the prone bodies up to ground level to be dumped on the pile of other corpses. A particularly brave piece of filmmaking for the director, whose own father was one such victim who met this most horrible of fates. The overall feeling throughout watching Katyń is one of helplessness. By dint of their geographical position, the Poles found themselves at the mercy of not one but two massively armed superpowers, a sacrificial pawn in a much larger game. “Poland will never be free”, one character confides, and even in older Poles today this pessimism is still clearly discernible. Only a few characters are able to articulate what they wish; Agnieszka, the bereaved sister and moral compass of the film, tells one unable to speak the truth, “I choose the world of the murdered, and not of the murderers”. With the pessimism comes a degree of pragmatism, survival over the desire to have the truth be spoken of, and it is this which prevents the film from sliding into sentimentality, something Flags of Our Fathers and the similarly revisionist The Lives of Others (2006) could be accused of. Only Wajda’s sometimes over-the-top visual symbolism and an at-times intrusive overly dramatic score threaten to overwhelm proceedings. 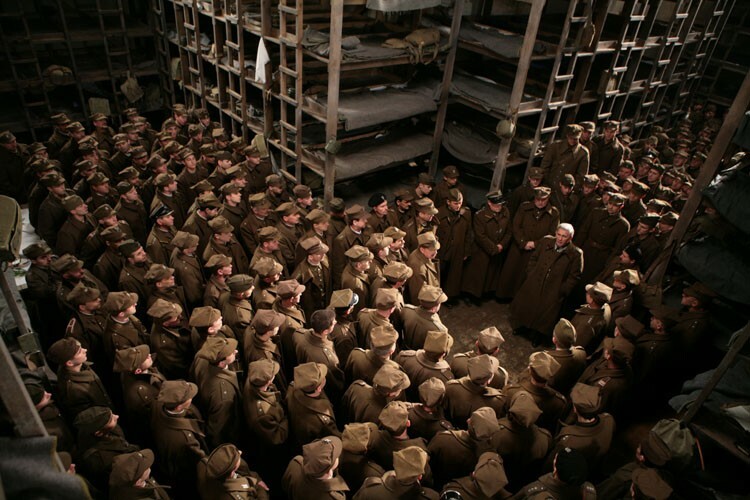 Wajda’s name is synonymous with the cinematic history of his country, and added to this his personal connection to the tragedy of Katyn, it is fitting that he should be one to produce this film in order to do the justice to the story that it deserves. The question would be why now, some twenty years after the lies stopped? Why has it taken so long for him to tell the story so close to his heart? Perhaps it is the contemporary relevance: wars continue to be fought on dubious propaganda, dodgy dossiers and all; there is an important lesson to be learned from history on that count. But also with Poland’s integration into the EU, maybe Katyń comes as a call for the country not to forget her own history; if there is anything positive to be taken from the tragedy of Katyn, it is that we must ensure that the truth is known by future generations, that the horrors of the past are not forgotten, and that ultimately we do side with the murdered and not the murderers. Great review, I definitely take your point about the score being overbearing at times but this is a small and forgivable sin in my eyes in the greater context of the film; something I can only call a monumentally significant piece of filmmaking. I dare to admit (somewhat embarrassed) that this is the first of Wajda's films I have seen, but through it my previously (and consistently) closed cinematic teargates were opened. Horrific, powerful stuff.